On Second Scoop: Ice Cream Reviews: Mission Accomplished! Wow, color me impressed! Our fellow ice cream brother Julien has come through with the big score. 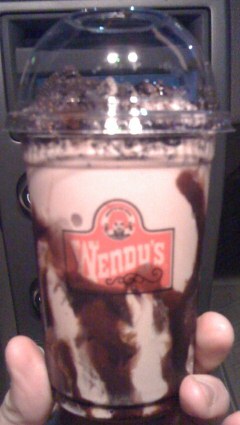 With minimal effort (and a really long drive), he managed to score a chocolate Oreo frosty parfait! Now this would have been enough to earn kudos in my book, but he goes double or nothing and gets a vanilla one as well just so he could compare! He apologies that the photos are a little dark, but you can definitely see that the chocolate is on the left, vanilla on the right. I love the fact he got one of each, why didn't I think of that! He mentioned that the vanilla was good, but the chocolate was better. Here's one more shot for good measure. Notice both of his treats appear to have way more sauce and at least double the cookies compared to my treat. Consider me jealous! 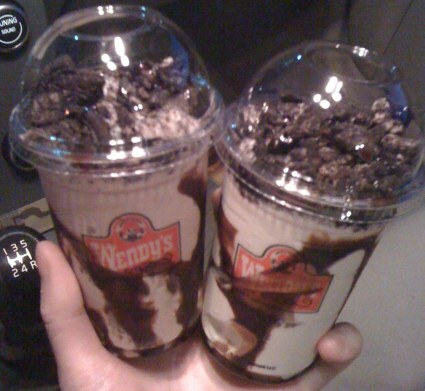 So there you have it people, the chocolate Oreo frosty parfait is possible! Just remember to be nice if you ask for one, and if they say no, just chill and try again another time. Nice job Julien!